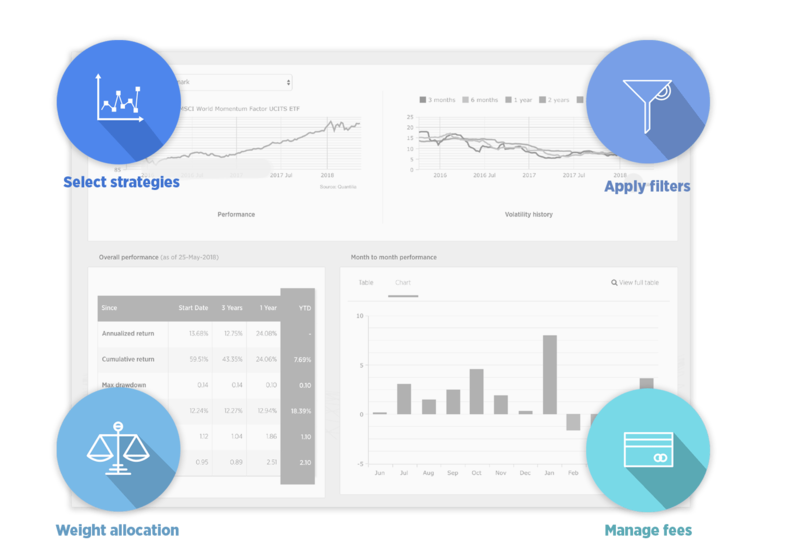 Quantilia helps you achieve high-precision investment opportunities and improve your performances with a pre-configured online data and portfolio management engine containing everything you need to build, test and run your portfolio. You will have access to a direct and independent data source comprising more than 60 asset managers, 2 million time series, 2 million daily updated fields on 80,000 financial instruments. The base also comprises investment banks’ indices including risk premia and smart beta indices, liquid alpha funds, sector and thematic ETFs (exchange traded funds), in addition to macro-economic data. All strategies available are classified according to our proprietary nomenclature and you can use advanced filters such as live track record or risk correlation to benchmark for a maximum ease of use. 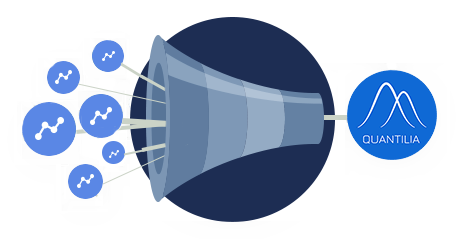 Quantilia’s multifunctional platform provides thousands of quantitative investment strategies traded in all formats. It allows the full control of all parameters entering into the construction of your basket, such as rebalancing frequency and weighting schemes. Its multidimensional simulations and stress test module will help you confirm the stability of your model and optimise your performances. The platform also enables the usage of statistics, risk metrics, factor analysis (momentum, value, carry, size, growth, etc.) ESG scores, the comparison of live and stress-test behaviours and the comparison of different strategies. Our user-friendly platform gives you an instant visual feedback to assess your portfolio’s performance and run daily automatic computation. You can create defensive and offensive profiles, compare different allocations such as SAA and TAA. The platform includes parameters to run peer, redundancy and loophole analyses, ESG (environmental, social, governance) criteria and principal component analysis (PCA). Benefit from enhanced visualisation tools with state of the art charts and diagrams, custom lists and custom dashboards to see the data you want the way you want. The platform also allows you to generate your own regulatory and marketing reporting with a clean layout that includes all the information you need.